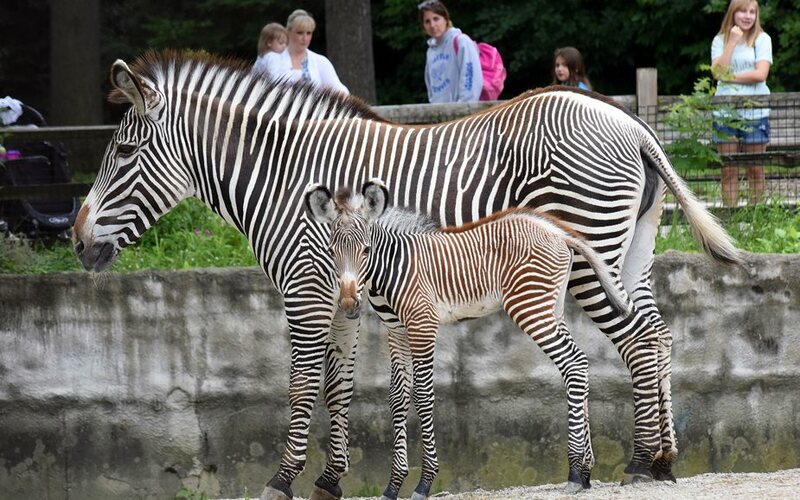 A female Grevy’s zebra was born at Brookfield Zoo on July 7. The nearly 100-pound foal can be seen with her mom, Kali, in a habitat located in the northwestern corner of the zoo. Kali, 5, arrived at Brookfield Zoo in 2011 on a breeding loan. The sire of the foal is 15-year-old Nazim, who has been at the zoo since 2001. The pairing of the two was based on a recommendation by the Association of Zoos and Aquariums’ Grevy’s Zebra Species Survival Plan (SSP). An SSP manages the breeding of a species in order to maintain a healthy and self-sustaining breeding population that is both genetically diverse and demographically stable. Currently, fewer than 200 individuals live in less than 50 accredited North American zoos. This is the first Grevy’s zebra birth at Brookfield Zoo since 1998. Grevy’s zebras, which are the largest of all wild equids, are listed as endangered on the Red List of Threatened Species of the International Union for Conservation of Nature (IUCN). The species is now found only in its native habitat of northern Kenya and southern Ethiopia and is considered to be extinct in Somalia. Researchers estimate that the Grevy's zebra population has declined by more than 50 percent over the past two decades, with only approximately 2,000 remaining in the wild. Major threats to the species include reduction of and competition for water sources; habitat degradation and loss due to overgrazing; and hunting. Most Grevy's zebras live outside of national parks on communal lands, making community participation in their conservation critical. While Grevy’s zebras are white with black stripes, at birth a foal is born with reddish-brown stripes that may turn black by one year. However, some animals tend to always have a brown tinge. The striped pattern, which is like a fingerprint and is unique for each individual, helps the zebra blend in with a background of grasses and shrubs, making it nearly invisible to predators. Newborns can stand, walk, and even run up to 40 m.p.h. within an hour after birth. They are dependent on their mothers for milk until they reach about 6 to 8 months of age.